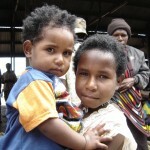 Buzz Off has sent a small grant of $AUD2000 to help resource clinics working in remote areas of Western Papua (Irian Jaya). Buzz Off has been supplying assistance these clinics for three years and has increased its commitment as the under resourced clinics have no other means of acquiring suitable medication for severe malaria. The clinics involved are the only source of medical assistance that is available to groups of remote villages in areas where Pf malaria kills hundreds of people every year. An on-site audit of medications used by the clinics showed that the only medication they were able to afford was Chloroquine which suitable for the treatment of P vivax but not P falciparum which is the cause of cerebral malaria and other deadly complications. Buzz Off will continue to support these clinics each year. We want to thank our donors who made funds available for this project. Donations to this project can be made at the Australian Mercy secure site select Buzz Off Meds from the donation menu.